Jeans are pants that are made from denim. Although in popular culture, these are referred to as denim jeans, blue jeans, or just jeans. 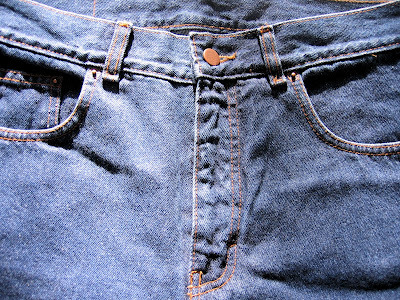 Denim jeans are identified with American culture especially the cowboy westerns. This is because jeans were popularized as work trousers during the California gold rush when Levi Strauss introduced them with copper rivets. The rivets served a purpose in that it made jeans more durable, giving more sturdiness at stress points such as pocket corners. The denim cloth gets its name from the city of Nimes in France (de Nimes). It is a rugged cotton twill textile. One particular feature of denim is that it fades over time. In denim jeans, fading occurs at stress areas such as the upper thighs, the knees, and ankles. People tend to favor this and it is not peculiar to see new jeans that have undergone processes to make it look old,used, and/or faded. Now, denim jeans are available in most any color. But it is primarily known for being dyed blue using Indigo. Indigo is a natural dye extracted from plants with a distinctive blue color. The cotton fibers in denim were difficult to dye using other dyes, so traditionally Indigo became the primary dye used for cotton. Today, almost all indigo dye used in manufacturing is synthetic. The few companies using natural indigo charge a premium for their product because of this. Some estimates suggest that producing one pair of jeans requires more than 2,500 gallons of water, nearly a pound of chemicals and vast amounts of energy. Multiply that by 2 billion — the number of jeans produced worldwide every year — and you get a snapshot of an industry that contributes a hefty share of wastewater and greenhouse gases to the environment. But an emerging greener chemistry process, described at the 16th annual Green Chemistry & Engineering Conference, could help change all of that. The conference is sponsored by the American Chemical Society's Green Chemistry Institute® (ACS GCI). The process, called Advanced Denim, can produce a pair of jeans using up to 92 percent less water and up to 30 percent less energy than conventional denim manufacturing methods, according to Miguel Sanchez, a textile engineer at Clariant, a specialty chemical company based in Muttenz (near Basel), Switzerland, that developed Advanced Denim. In addition, it generates up to 87 percent less cotton waste (which is often burned, adding carbon dioxide and other greenhouse gases to the atmosphere) and virtually no wastewater. Unlike conventional denim production methods, which require up to 15 dyeing vats and an array of potentially harmful chemicals, Advanced Denim uses just one vat and a new generation of eco-advanced, concentrated, liquid sulfur dyes that require only a single, sugar-based reducing agent. All other production steps are eliminated, according to Sanchez. If just 25 percent of the world's denim jeans were dyed with this technology, Sanchez said, it would save enough water to cover the needs of 1.7 million people every year. That's equivalent to about 2.5 billion gallons of water every year. It also would forestall the release of 8.3 million cubic meters of wastewater, save up to 220 million kilowatt hours of electricity and eliminate the release of a corresponding amount of carbon dioxide emissions into the atmosphere annually. "Advanced Denim wants to go beyond the technologies that are today considered standard for obtaining denim material," Sanchez said. "We offer new possibilities for enlarging the number of tones and effects currently achievable, make production more simple and efficient, and all this with the minimal use of resources." Sanchez said that Clariant is working with many of the world's leading jeans manufacturers and that there is high interest in adopting Advanced Denim technologies. "This is another great example of the kind of positive impact adopting green chemistry offers businesses: Major savings in key materials, energy, water usage, waste and emission reductions, and ensuring your right to operate in communities around the world," said Bob Peoples, Ph.D., director of the ACS GCI.